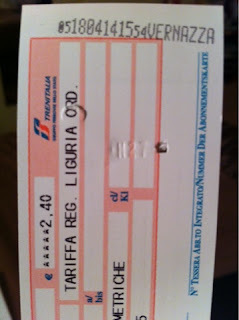 On our second trip to Tuscany in September/October 2014, four of us stayed in the same wonderful apartment Casa Iris that Debbie and I rented in 2011. 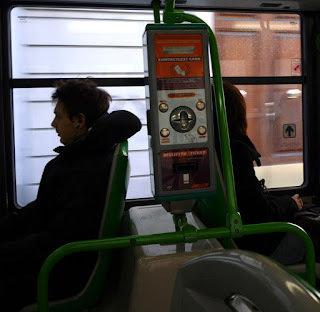 On our last full day there, we decided to take the city buses to Piazzale Michelangelo to see the most spectacular view of the city of Florence. 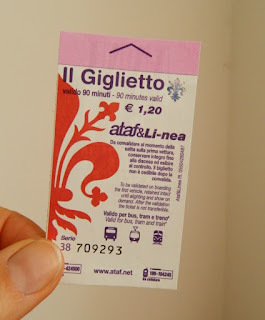 Since the bus ticket was good for 90 minutes, we thought we could make the whole trip from Piazza della Liberta near our apartment to the city center by the Santa Maria Novella train station and then up the hill to Piazzale Michelangelo and back to SMN on one ticket each. All went well until one stop before SMN station on the way back, when the bus was boarded by three "bus police" officers. They came directly to us and demanded to see our tickets. Unfortunately, our time had run out five minutes earlier. They asked for our passports. I had a copy of mine; Debbie had neither her passport of a copy. The other couple had theirs. One officer said "these tickets are finished!" This resulted in a 50 euro fine for each of us! Another officer said "they are only five minutes over." That got our hopes up, but the first one was relentless, repeating, "the tickets are finished." We protested to no avail. Debbie and I paid them cash after we received our fines. They decided not to charge Debbie another 50 euros for not having her passport. Phew! Our travelling companions didn't have the cash and were escorted to the bank at the train station to withdraw the money! We were foolish to try to cut the timing so close on our tickets and, considering that we had extra tickets with us (the "police" didn't care), we should have just validated those when we noticed we were over the time. Also, we were aware of the possibility of a big fine if we hadn't validated the tickets when we boarded the bus. We weren't without fault in this fiasco. Bus tickets cost only 1,20 euro each at most tabacchi shops (look for the sign with the big "T") and are a good deal, so don't try to save money by stretching their time limit like we did. It's just not worth it. While the fines could be appealed within thirty days, it must be in Italian and you may have to be present. We decided not to worry about that. 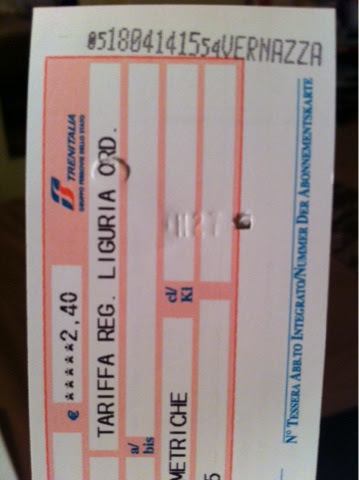 Lesson learned: always validate your bus ticket ON the bus (see two bottom photos) and pay attention to the time limit! Click ATAT Bus Tickets. 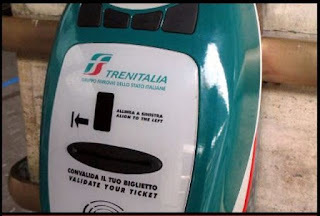 Also, train tickets (top three photos) must be validated BEFORE boarding the train (unless you have reserved tickets that you printed at home) or you will face a similar fine. 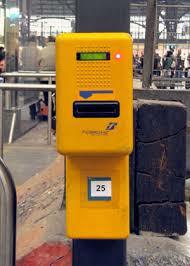 Look for the blue or yellow validation machines on the platform. We chose not to let that experience ruin our day and found a nice trattoria near San Lorenzo for lunch. The food was good and the wine relaxed us enough to talk, complain and laugh about the incident.